If you're an avid collector of Batman paraphernalia you might want to get your hands on this Batman-like flashing red phone from AbleComm, Inc. 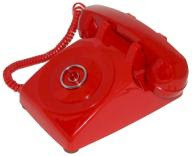 This phone has a red flashing light right in the center, just like the Batphone to attract your attention. You don't need to plug it into any power line since it gets all its power using just the phone line. So Batman fans, go ahead and get one and maybe next time you can get your hands on a real utility belt and your crime fighting dreams will come true.